Australia and sunshine go hand in hand. From beaches to barbecues to backyard cricket, basking in the sweet sunshine is an integral – and often unavoidable – part of life in Australia. This is especially true in summer, when temperatures soar, the sun really makes its presence felt, and staying cool feels like an impossible challenge. However, this fun in the sun comes with one crucial caveat: sun safety. Sun safety is incredibly important, particularly in a tropical climate like Australia. Sadly, 2 in 3 Australians will be diagnosed with skin cancer before the age of 70, with approximately 95% of these cases being a direct result of exposure to the sun . Thankfully, the news isn’t all bad, as there are plenty of ways to enjoy the heat while still being sun smart. While most people probably know the ‘golden rules’ of sun safety – ‘slip, slop, slap’ – we’re taking things one step further. Our comprehensive sun safety guide details all the sun safety facts (and myths) that you should be aware of, plus the major do’s and don’ts of sun safety. So, slip on some reading glasses and slop into a comfy seat, because our sun safety facts have got you covered. Before we get to what you should do to stay sun safe, it’s important to clear up a few common sun safety misconceptions. Perhaps the biggest misconception is that you can only get sunburned on a hot, sunny day. This is untrue. Temperature and ultraviolet (UV) radiation levels are not inherently linked. Rather, you’re at risk whenever UV levels exceed 3. To put this in context, the UV index is a forecast produced by the Bureau of Meteorology, which shows the danger and intensity of solar UV radiation each day. Points on the scale correspond to 25 milliwatts/square meter of UV radiation. In many parts of Australia, UV levels rarely dip below 3. In other words, you can still get sunburned when it is cold outside. Depending on other variables, a 10° day, a 20° day, and a 30° day could have very similar sun safety risks. Additionally, you can get sunburned on overcast or windy days. While this might seem counterintuitive given the sun isn’t visible, UV rays can still penetrate the clouds. In some instances, the UV rays might actually be more intense on overcast days, as they reflect off the bottom of the clouds. Another common sun safety misconception is that shade completely protects you from UV rays. This is only partly true. To be clear, seeking shade is definitely a good idea to protect you from direct sunlight. However, you will still be exposed to some UV rays while in the shade. Likewise, you can be sunburned through glass, or even a car window. While glass greatly reduces your exposure to UV rays, it does not completely eliminate it. Therefore, you can still be sunburned if you spend a long time in the car or near a sunny window without taking adequate sun safety precautions. With these misconceptions debunked, it’s time for some sun safety facts. Unfortunately, the numbers don’t make for pretty reading. Every year, more than 2,000 Australians die from skin cancer. According to the World Cancer Research Fund, this means Australia has the highest rate of skin cancer in the world . Although skin cancer is the 19th most common form of cancer worldwide, Australians are four times more likely to develop skin cancer than any other form of cancer, and are significantly more likely to die from skin cancer than a car accident . Further, 67% of Australians who die from skin cancer are men, while 2 in 3 Australian men will be diagnosed with skin cancer before the age of 70, compared to 3 in 5 women. To make matters worse, a recent study found that 90% of Australians don’t fully understand sun safety. More specifically, they are uncertain about when it is necessary to protect yourself from the sun. While experts recommend sun safety measures should be taken whenever UV levels exceed 3, only 1 in 10 surveyed Australians were aware of this, with nearly a quarter falling for common myths, such as sunburn being related to temperature, or that you can’t get sunburned on an overcast day . To stay sun safe while exercising this summer, be sure to check out our 7 Summer fitness tips for a healthier you. While these statistics are pretty scary, the good news is that there are lots of things you can do to stay sun safe. You have probably heard the same sun safety advice for years – slip, slop, slap. If you’ve been paying attention, you might have also heard ‘seek’ and ‘slide’ added to this list. Well, there’s a good reason this sun safety advice is so ubiquitous – because it works. Actually, studies have shown that since the 1990s, when the slip, slop, slap campaign was first introduced, skin cancer rates have fallen 5% per year among young people (15-24 years old) . Why? Well, let’s go through each step, one by one. ‘Slip’ means slip on some covering clothing. While it might seem weird to wear long sleeves or long pants in scorching hot summer temperatures, it’s important to cover as much skin as possible from the sun. This could mean collared shirts (or even light scarves), long sleeves, or covered shoes. When buying new clothing, be sure to check the label for an ultraviolet protection factor (UPF) rating, which indicates how much UV radiation will pass through the material. A UPF rating of 15+ provides decent protection, although UPF 50+ is ideal. It’s also important to note that not all clothing is equal when it comes to sun protection. Fabric provides less protection from the sun when wet, while darker clothing with tighter fabric typically provides better protection than bright colours, stretched out clothes, and loosely woven fabrics. The second point might also be the most important: slop on some sunscreen. It can’t be any old sunscreen though – there are a few important rules to follow. The sunscreen should be SPF 30, at minimum, and should be applied to clean, dry skin 20 minutes prior to going out in the sun. Further, you should reapply the sunscreen every two hours. The average adult should apply roughly one teaspoon of sunscreen each to their head and neck, arms, legs, and the front and back of their body, for a total of 7 teaspoons (about 35ml). It is also important to buy a broad-spectrum sunscreen that protects against both UVA and UVB rays. Finally, don’t think of sunscreen as a protective suit of armour. While it provides decent protection from the sun if applied correctly, it certainly doesn’t make you invincible, and it should always be used in conjunction with other sun safety measures. Slap on a hat. Again, it shouldn’t just be any hat. For example, caps and visors don’t provide sufficient protection. 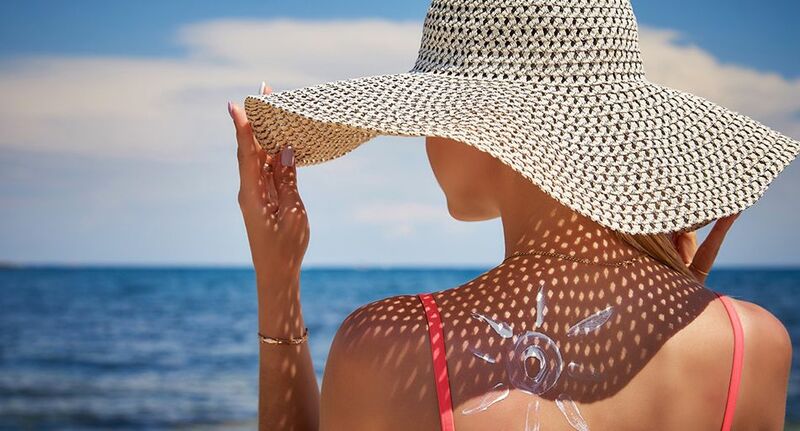 Rather, aim for a broad-brimmed hat that shields your face, nose, ears, and neck, which are among the most common areas for melanomas to develop. As with your clothing, look for a UPF rating when purchasing a hat. Remember, UPF 50+ is ideal! Seek shade. This one is fairly self-explanatory, but still extremely important. Whether it’s under a tree or you bring your own shade umbrella, seeking shade is a crucial aspect of sun safety. As we explained previously, you can still be exposed to UV rays in the shade. However, your risk is greatly reduced compared to direct exposure to the sun. Basically, like sunscreen, shade doesn’t make you impervious to the sun, so it needs to be combined with other sun safety measures. Last but not least, slide on some sunglasses. Research shows that wearing sunglasses and a broad-brimmed hat together reduces UV radiation exposure to the eyes by 98% . For maximum protection, look for sunglasses with large lenses that are both close fitting and wrap around. Other things to look for are a ‘category 2’ tag on the sunglasses’ label, as this indicates they absorb 95% of UV radiation, as well as sunglasses with an Eye Protection Factor (EPF) of at least 9.